Despite its harsh treatment by the state, the Spanish manufacturer is back in Milwaukee. A group photo in front of the Carnitas train car. Photo by Jeramey Jannene. 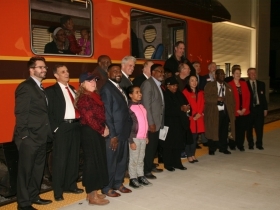 A group called “All Aboard Wisconsin” held a reception at the Milwaukee Intermodal Station on Tuesday to welcome back Talgo USA, the Spanish manufacturer of railroad rolling stock. The event was held in the 1948 passenger rail car Caritas, and had as an additional pretext the honoring of Ald. Bob Bauman as the “2016 Connect Milwaukee Champion” for his work on rail transportation issues. Bauman is an undisputed authority on the subject. In fact, it was his firm that completely refurbished the Caritas in Milwaukee in 1983. 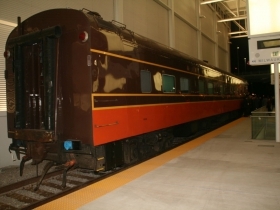 The 850-square-foot car is owned by Clark Johnson, who shared the hosting duties with Nona Hill, whose name appears with his on the door of the master suite of the railcar. She is the president of All Aboard Wisconsin. In brief remarks, Hill said that her group favors public transportation of all modalities. 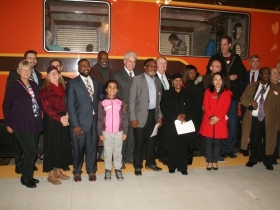 The event was organized by Gary Goyke, the AAW Legislative Director, who handed out a timeline of Talgo’s troubled history in Wisconsin dating back to July 2009, when the state committed to the purchase of two Talgo trainsets to be built in Wisconsin. The state also initiated plans to extend rail service to Madison on the Hiawatha line, and to eventually connect to St. Paul. However, Milwaukee’s location, workforce and the proximity of Century City to rail lines came in handy in September 2016 when Talgo announced it had received a $72.9 million contract to refurbish 74 Los Angeles subway cars there. The 46-month project would employ 37 skilled workers in Milwaukee. 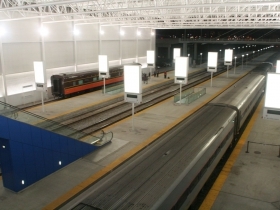 Bauman said it is likely that Talgo will receive other contracts, since there are rail cars in Chicago and Detroit that need to be refurbished. The Spaniards may be here to stay. The Talgo decision is a bit of good news for the economically distressed central city of Milwaukee. Randy Crump, who attended the event with his son Lafayette Crump, was pleased with the announcement that more jobs are coming into the community. Also attending was Earl Ingram, a radio voice of the community who has been involved with the RadioActive movement to counter AM talk radio as currently constituted. They were joined by Karen Kresch, Chris Rockwood, Pam Ritger, Joe Petrie, Bill Johnson, Shauntay Nelson, Caryl Terrell, Dave Rasmussen, Anna Varley and others including candidates Kashoua Yang and Scott Wales, each of whom is vying for the Branch 47 judicial seat held by Judge John Siefert. Elected officials included LaTonya Johnson, the state representative who will serve in the state senate next term. Fellow member of the assembly Evan Goyke was also in attendance at the event organized by his father. Gary Goyke mentioned the new train barn, and marveled at the station in general. He noted the diversity of the travelers in the station, and added that the setting had a big city feel to it. An official ceremony will wait for better weather, but ground has been broken on the Milwaukee Streetcar project beyond the preliminary relocation of utilities. Bauman said that work has begun on the construction of the maintenance facility for the streetcar, to be located under the freeway at N. 5th St. and W. St. Paul Ave.
Ald. Bob Bauman plans to wed Tammi Bansmer in a Christmas Day ceremony to be held at his residence, the couple told guests at the event. A full day of speakers and workshops adressing transportation issues is planned for Saturday, December 3rd at MATC. U.S. Secretary of Transportation Anthony Foxx has been invited to speak at the event organized by WISPIRG, 1000 Friends of Wisconsin, the Sierra Club-John Muir chapter, Wisdom and Wisconsin Green Muslims. The event will begin with a 9 a.m. breakfast, followed by listening sessions, plenary sessions, lunch, workshops, training, roundtable discussions and a 4 p.m. reception. A $10 donation is recommended. Congratulations Milwaukee and Talgo! Governor Walker was able to save the state huge amounts of money in continuing operating expenses with his smart decision to kill the build of an unnecessary rail line, and Talgo is doing great work in Milwaukee. There was quite a bit of conflict around this, but ultimately it ended up being a win-win for both sides. WashCoRepub: Yes it is always a win for the state when it pays $50M and receives nothing. You might want to crawl out from under the rock you’ve been living under for some years. Your ignorance is on display. But thanks you reinforce my thoughts about repub ideologues. Wisconsin’s “huge savings” (by not extending the train to Madison) come to about $5 million/year—roughly the cost of widening 1/2 mile of rural interstate from 4 lanes to 6. If Walker took these “huge savings” and applied them to the I-90 widening south of Madison (which might be avoided if there were a Madison–Chicago train), it would take over a century before there were enough savings to pay for the highway expansion cost. WashCoRepub: how is paying out 50 million, because of Walker’s foolishness, a win? The only win the state will have is when that idiot is voted out of office. Just imagine if there had been sufficient wisdom to apply all that money to upgrading the Hiawatha line between Milwaukee and Chicago instead. It would be done by now and there would be fast rail on that line today. When I look at the photo I think; that’s what America looks like. The White Supremacist that Trump made his chief strategist would no doubt be appalled by the notion of such diversity. WashCoRepub: Contrary to what the article says, the state paid Talgo $47 million for the two trainsets it refused to accept. How smart is that? Plus the ongoing maintenance paid to Amtrak for the junky 20+ year old Horizon equipment is more than the state would have paid Talgo under 20 year maintenance contract that accompanied the purchase. How smart is that? Also, the purchase of these two trainsets had nothing to do with the $820 million grant for the Hiawatha extension to Madison. The extension, part of the Midwest Regional Rail System, developed by nine Midwestern states, included two more trainsets. mrbradleyc: Upgrading the Chicago-Milwaukee route to true high speed is a much bigger project and is much more expensive than you might imagine. This is in the state’s long term plans. WashCoRepub: I know facts aren’t easy, but you are mixing two separate projects into one. The first project was for Talgo to build two trainsets for Wisconsin so that the state would no longer have to lease junky, 20+ year old Horizon cars from Amtrak. Included as part of the contract was a 20 year maintenance agreement. This deal would have allowed the state to have new, more attractive equipment at a lower cost long term. Instead, Walker refused to accept the trainsets even though state had paid Talgo $47 million for them. Wow, that’s really saving the taxpayer money! Beyond this, the state wasted tax dollars fighting Talgo in court. The end result being that the state will get $9 million from Talgo if Talgo sells the trainsets. What a deal! This Talgo contract was separate from the Federal grant of $820 million to extend the Hiawatha service to Madison. The Madison extension, if it had been carried out, would have resulted in Talgo building two additional trainsets. By the way, the Madison extension included full federal funding of the Milwaukee station trainshed rebuild. Since the project had to be done for ADA compliance, the state had to come up with $15 million to pay for its share of the rebuild under a different federal program. Also, Scott Walker is now planning to add 3 daily Milwaukee–Chicago Hiawatha round trips. Wisconsin will have to find a 3rd train set for the added train service. 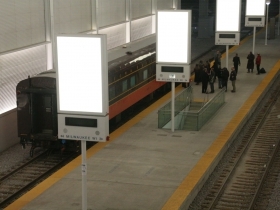 Those Talgo trains would come in handy for that added service, but Wisconsin basically gave them away (after paying most of their cost).